If there was ever a Monday dish to get excited over, this is SO it. It’s mac and cheese, just fancied up a bit. BUT not fancied up so much that you’re just, “no”. You know what I mean? I feel like sometimes mac and cheese can be made way too fancy. To me, mac and cheese should be pretty simple and of course, loaded to the brim with good cheese. 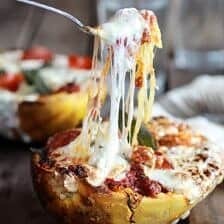 That’s why I typically like to use a minimum of four cheeses. Always, always use a really good, really sharp cheddar… and then have fun with the rest. Well, at least that’s my two cents. My brothers are all about the simpler the better, and in the case of mac and cheese, I actually understand that. That all said, I do think a little twist, just a simple one, can be SO good. 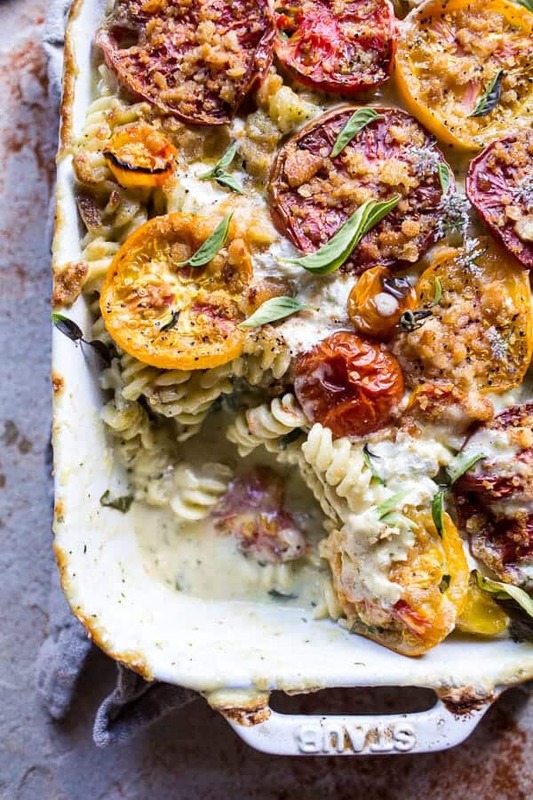 Like today’s 4-cheese caprese mac and cheese. 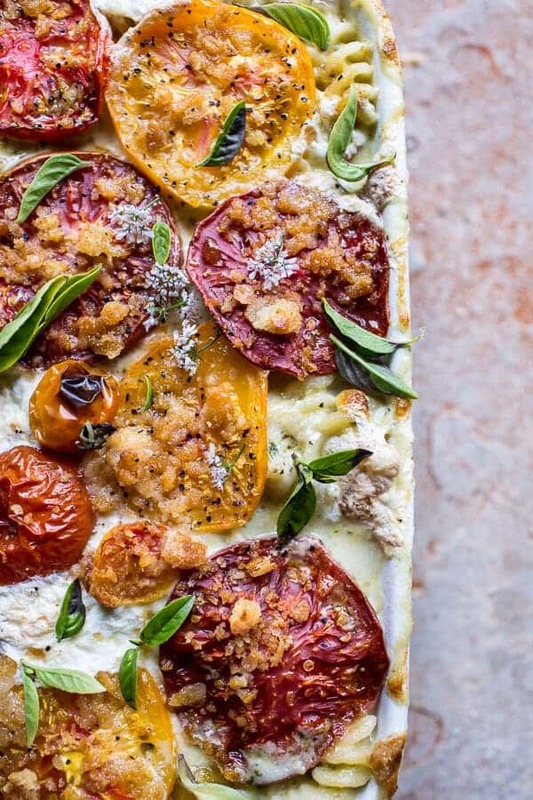 I mean, how could caprese anything be bad?? Answer?? It just can’t. 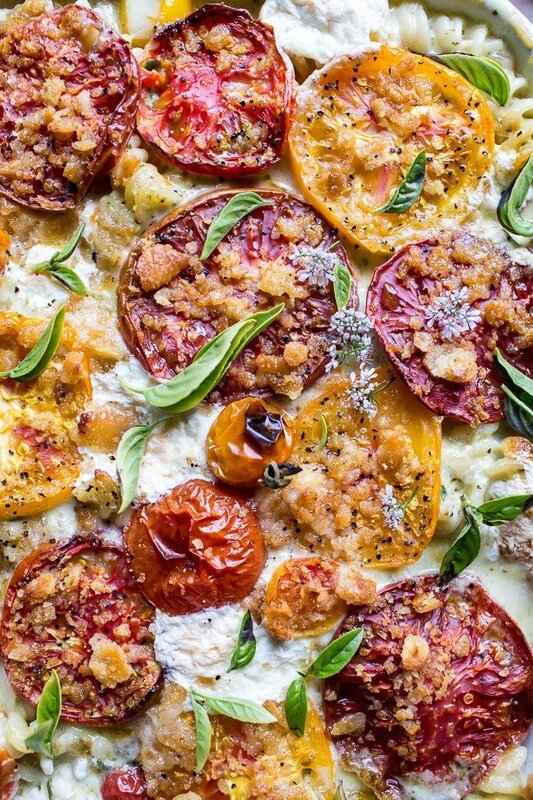 It’s tomatoes, cheese and basil…enough said. 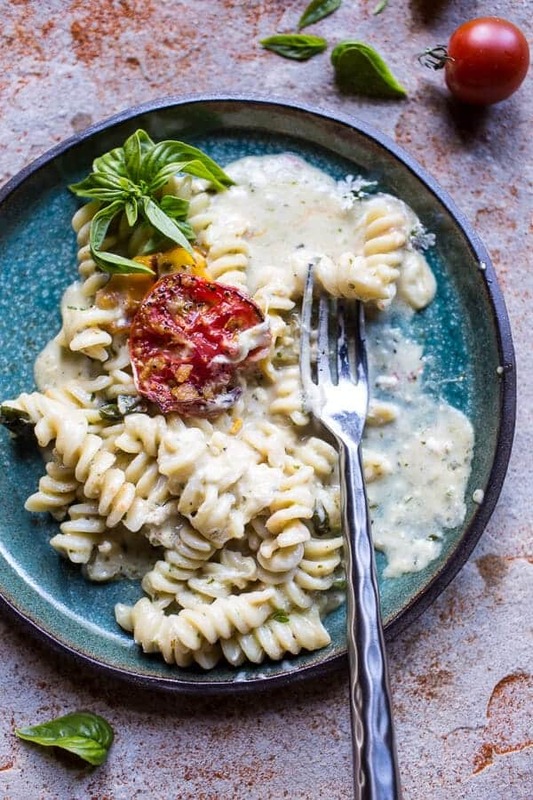 Caprese turned into mac and cheese?? Pure heaven. You’re adding pasta, butter and basically doubling the cheese. Yes, yes, yes. See, I told you, this is the kind of Monday food we all dream of. And ok, it’s also the very last day in August. This means a few things. …one: September first is tomorrow. I am both crazy excited (love fall! ), and crazy scared (the summer just FLEW by, like Lightning McQueen speed!). …two: September first is also a kind of big day for me. Again, excited and scared…but you will all see what I am talking about soon! 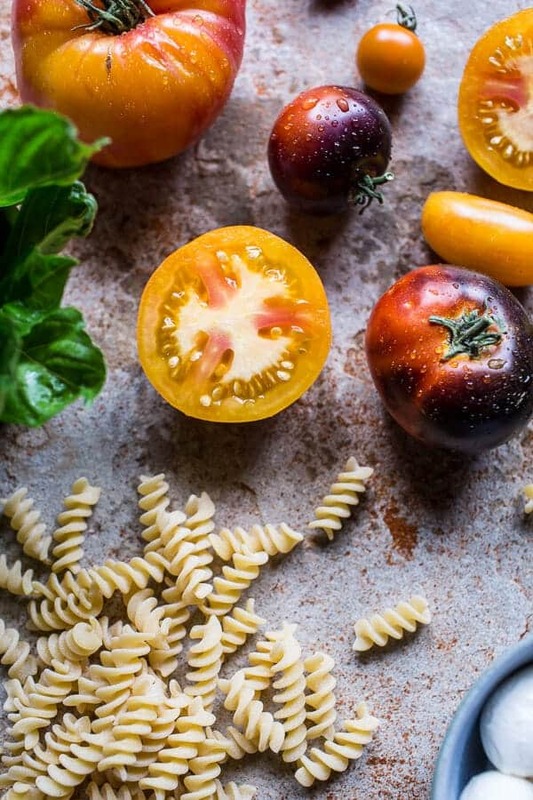 …three: with the end of August comes the most DELICIOUS end of summer tomatoes. This means caprese everything, tomatoes everything and corn, zucchini plus all the other summer produce. Take advantage of it while it is here! 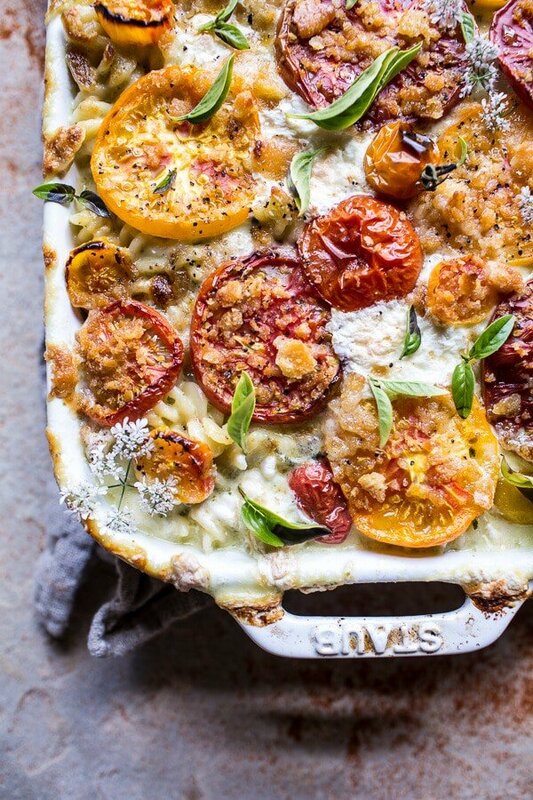 So let’s talk about this mac and cheese. While, hold on a sec, I have to first say, I am still recovering from the events of Asher’s B-day yesterday, so please forgive me for my lack of words. I might just be wiped out for the rest of the week after the weekend we had. That girl knows how to throw a party. Whoa baby. Also, I am not making another cake, especially another three layer cake (I made ANOTHER one for her party) for at least a year…SO over cakes!!! This mac and cheese though. Isn’t it kind of pretty? 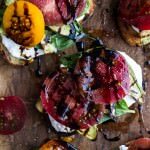 I just adore those roasted, butter heirloom tomatoes, my freaking favorite! The recipe itself is really simple. 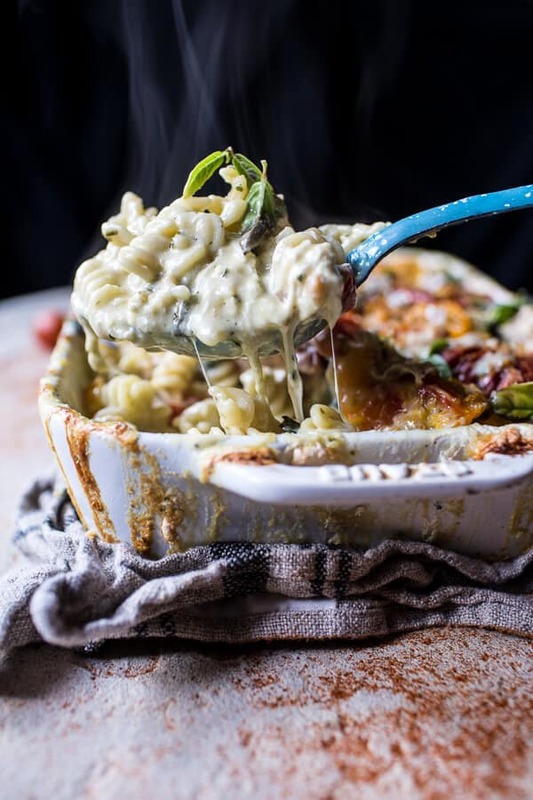 It’s honestly just your basic mac and cheese (with cheddar, mozzarella, havarti and…BRIE!) with the addition of basil (in the form of pesto!!) and tomatoes. Simple, but oh so good. It’s creamy, luscious and basically everything you could ever want in a mac and cheese. 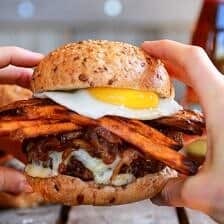 Trust me, if you make this, there’s not a chance on earth you will be disappointed. 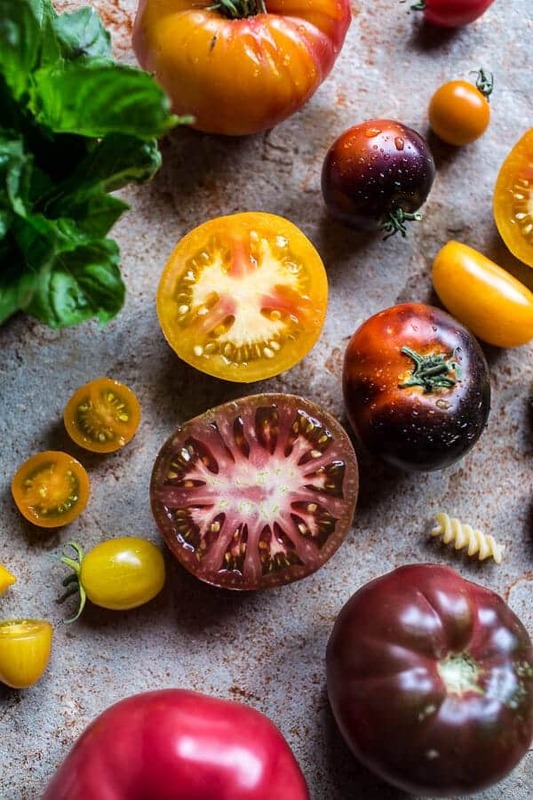 Oh, and I do highly recommend trying to incorporate some heirloom tomatoes into the recipe, as they are so perfectly sweet and gorgeous right now. I really cannot get enough of them. 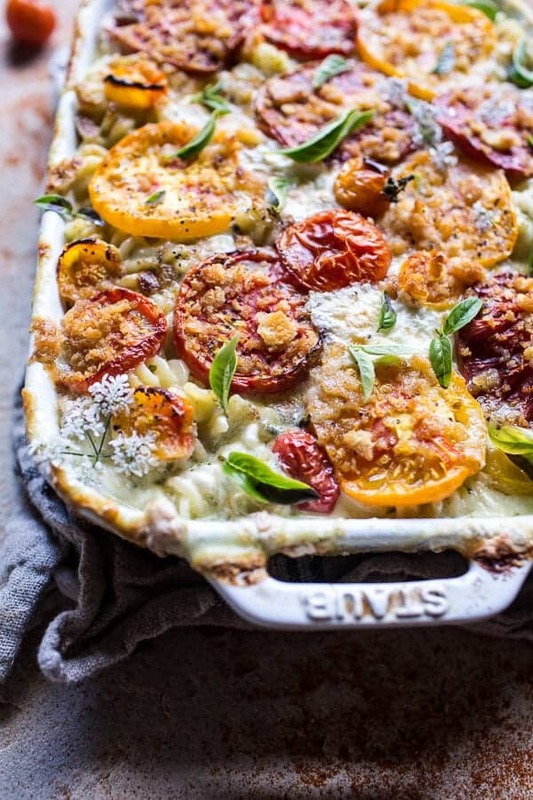 Double oh, how perfect would this mac and cheese be for your Labor Day feast next week? Perfect way to say goodbye to summer and hello to fall…right? Plus, plus… it also doubles as really great football food. See, such a multi versatile dish. Win, win! Preheat oven to 375 degrees F. Spray a baking dish with nonstick spray or lightly grease with oil. Bring a large pot of salted water to a boil. Boil the pasta until al-dente. You want it to have a bit of bite to it. It will finish cooking in the oven. Drain well. 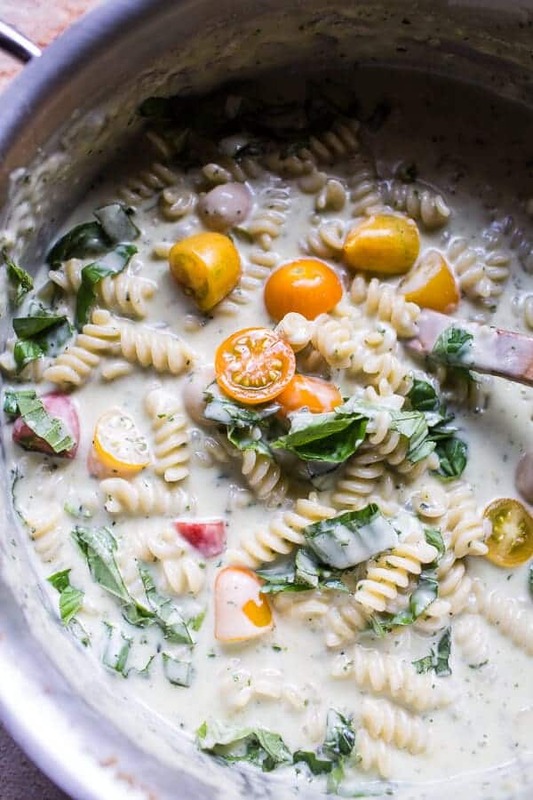 While the pasta boils add 3 tablespoons butter to a medium skillet and melt. Add the garlic and sauté 30 seconds then throw in the crushed crackers and toss to coat. Toast the crumbs for 3-5 minutes, stirring frequently to avoid burning. Once the crumbs are lightly toasted remove form the heat and set aside. In the same pot you boiled the pasta, melt the remaining 4 tablespoons butter over medium heat. Whisk in the flour. Reduce the heat to medium-low and let cook/bubble for 1 minute, stirring once or twice to avoid burning. Gradually whisk in the milk and raise the heat up to medium-high. Bring the mixture to a boil, whisking frequently until the sauce has thickened, about 2-3 minutes. Remove from the heat and stir in all of the cheese, pesto, mustard powder, cayenne, salt and pepper. Stir until the cheese is fully melted (if needed, return the pot to the heat to fully melt the cheese). Stir in the pasta + cherry tomatoes and transfer to the prepared baking dish. Evenly layer the sliced tomatoes on top of the pasta. Sprinkle on the toasted cracker crumbs and place the baking dish onto a baking sheet. Bake for 25-30 minutes or until the crumbs are golden brown and the sauce is bubbling. Remove from the oven and let site five minutes (yeah, right). Top with fresh basil. Dig in!! I think I’ll just take a faceplant into that plate now. Yes, I do think that is the best idea I have had all day. Beautiful! Mac and Cheese is one of my favourite recipes ever! I seriously need to go raid my local grocery store for all the delicious tomatoes I can find! This is beautiful but I’m on the boys side–I like it plain. I mean, I may have just made that up now. 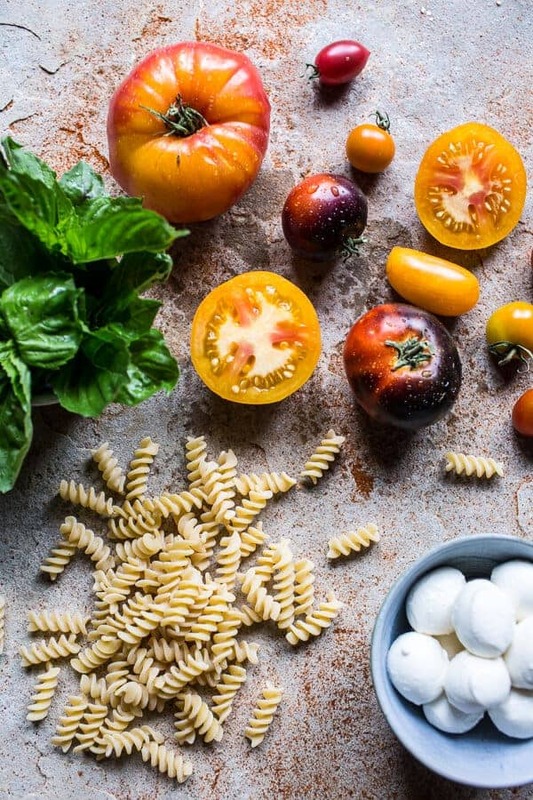 BUT, I adore anything caprese…and then on mac and cheese? YOU WIN. Pinned! Awesome ! Yum ! Thanks for helping me out with dinner 🙂 This is going to be so good, and all that cheese…can’t wait ! Whoa, this is dinner. Awesome. I”ve read that woman either like to cook or clean, but rarely do they like to do both. My wife cleans. And orders Chipotle. This sounds delicious. I’m going to try to make the pasta the night before and then put the tomato/cracker topping on right before I put it in the oven. 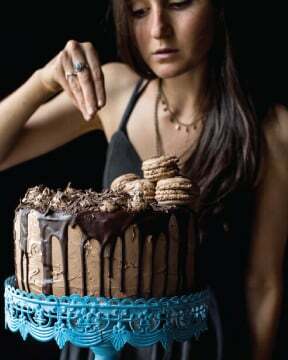 Do you recommend how long we should bake it, if refrigerated over night? Hi! I would think just 10-15 minutes longer will be perfect! Hope you love this! THANKS! Yes, please!! The more cheese the better. And I just love the pesto in there! Uh, yes please! All of my favorite cheeses especially havarti. I need all of that in my face right now. My kids love my home made mac and cheese. 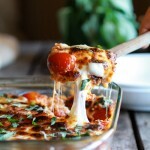 I always add sliced tomatoes before baking but I’ve never thought of pesto and mozz! Yours is beautiful and I’m going to make it next weekend when I go visit the kiddos and the new grand. Amazing photos, Tieghan. You rock. This looks incredible!!! And the havarti…..my absolute favorite cheese! I’m so tempted to try this fancy recipe for dinner tonight. This is beautiful! And I know my husband would love it. WOW! this is awesome. I love a good mac n cheese. I wish I could find pretty tomatoes like this around here! I’m known for bringing mac and cheese to our annual friendsgiving. 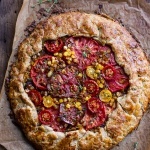 This recipe makes me want to have it early, just so I can get the perfect tomatoes to show it off. hrmmm maybe a harvest party is in order. I think I’m in love with your Mac ‘n Cheese!!! Oh yeah Tieghan! I agree, this is so it! Sounds so creamy and delicious! Perfect for any day of the week! 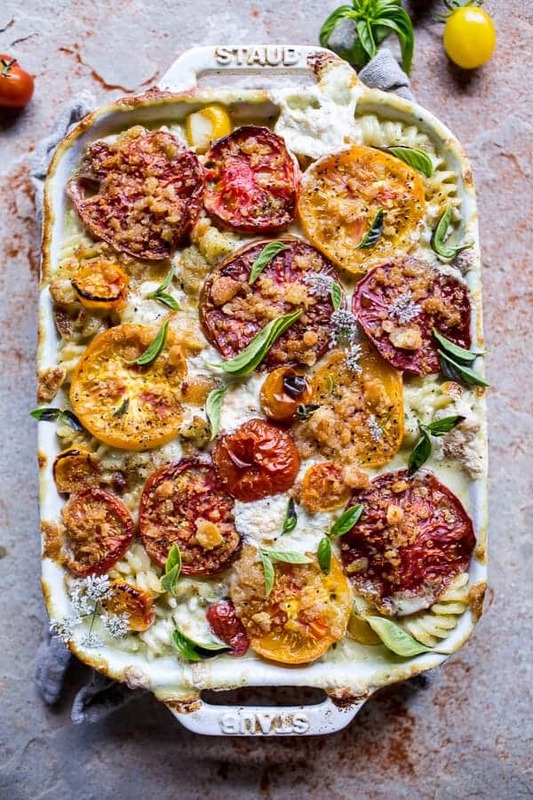 I think you’ve made mac and cheese look healthy with all those tomatoes on top! 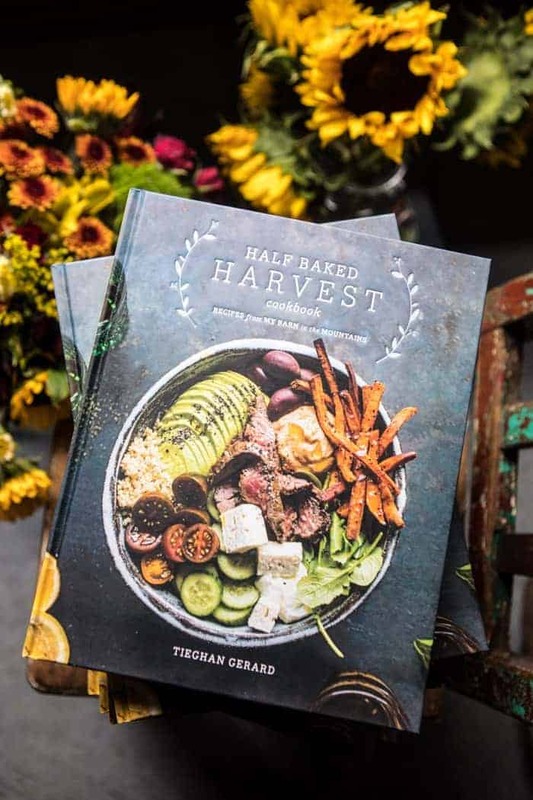 I love how beautiful this dish is and can’t wait to give it a try! 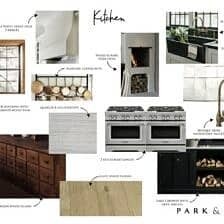 I think this looks heavenly and can’t wait to try it for my family. We have amazing tomatoes and basil from the garden that are just calling to be used in the recipe. Beautiful photos as always. Thanks so much! Hope you gals are having a great week! 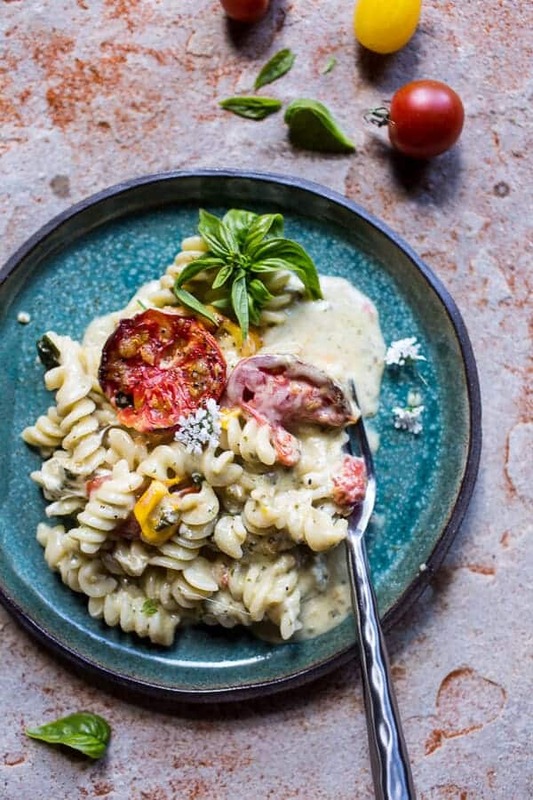 My sister would LOVE this–she’s the biggest fan of caprese and mac n’ cheese! How about adding some zucchini and corn to make a healthier version, and using almond or soy milk? Yum! I love the idea of the spiral pasta! I am glad to see the different cheeses and have yet to meet one I don’t like. 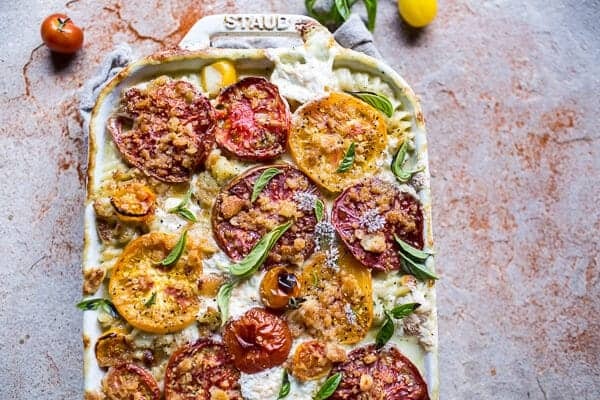 The tomatoes are just the color and flavor pop this dish needs. I made this this weekend. It was SO good fresh. I even took a video of how gooey and cheesy the sauce was when I was making it! But it makes a lot so there were lots of leftovers and unfortunately, it did NOT reheat well. I think it is primarily from the olive oil in the pesto that goes into the cheese sauce. Once the olive oil cooled down and solidified in the fridge, the sauce “broke” and had a weird texture. I think if I were to make it again I would probably try tp just add the ingredients for the flavor of pesto (basil, cheese, garlic, maybe some pine nuts) WITHOUT the olive oil to see if that works better. Hi! The recipe calls for a cup of cracker crumbs, and that is what I used. Your photos look as it you used much less than one cup. One cup completely covers the tomato slices. I am sure it will be delicious, but can you tell me where the cup of crumbs disappeared to in your photos? It is in the oven now and smells delicious. I probably used 1/2 cup of crumbs for photo, but only because I did not want to cover all the tomatoes for photos. When I reheated the dish for dinner I added all the crumbs. Enjoy! Oh, and I added fresh grated parm on top of those heirloom tomatoes. Because it was there! How can you not? I love your recipes! 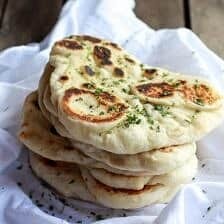 Would you ever be able to do a recipe with English measurements? Or somehow be able to convert these ones into grams? This dinner was a big hit at my house. And contrary to a previous commenter, I did not have any difficulties with reheating the leftovers – they were equally as delicious as when first baked. Thanks so much for the wonderful recipe. SO happy you loved this mac + Cheese!! It is a favorite of mine!! I just used basil and that is all the green stuff in the dish, BUT spinach or kale would be delicious I am sure! Thanks again and have a great weekend! Can this be made earlier in the day, refrigerated for 3-4 hours, and baked later on? Yes, that works great! Hope you love this mac + cheese! Our Cheezytoons would love to be in your kitchen! hehe! Thank you! Hope you had a Great Christmas! Awh yay!! So happy you like it so much Kelsey!! This Mac and cheese is a HUGE hit at my house, even for my 3-year-old who doesn’t like mac and cheese that much (I know. What is this?)! I like to add a little basalmic reduction after it’s done. I can’t wait to make it again tonight with a big Caesar salad and some crusty bread! Doesn’t like mac and cheese?! Haha never heard that before.. but I am so happy he likes mine!! Thank you so much Kori! 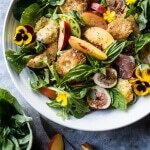 The addition of the Caesar salad sounds amazing! 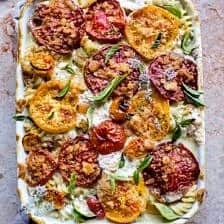 Hi!😁 I want to make this dish and I have one question – what can I substitute for havarti cheese? I don’t sure I’ll get this. Your blueberry pie was a hit in my house. Everyone enjoyed this. Delicious dessert! Your blueberry pie was really delicous. Everyone enjoyed this. Any cheese you love will be great! More cheddar works too!